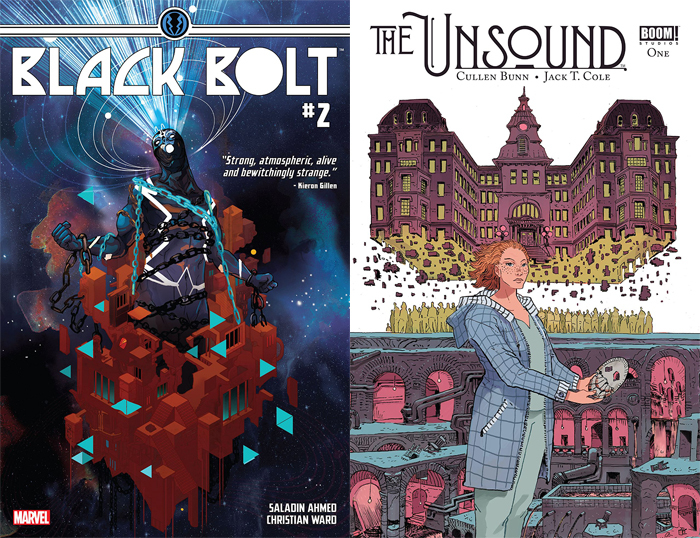 Home »Comics»Deadshirt is Reading: Black Bolt and The Unsound! Deadshirt is Reading: Black Bolt and The Unsound! Black Bolt continues to be a treat. This installment is more of a character building issue, as the title character finds himself adjusting to prison life along with his fellow inmates—including Carl Creel, a.k.a. The Absorbing Man. Creel steals nearly every panel with his wisecracks, especially needed when the book focuses on a character who barely speaks. I particularly like his hysterical outburst at hearing Black Bolt’s real name (Blackagar Boltagon, for the uninitiated). The most interesting addition to the book is Raava, a Hulk-like Skrull warrior who initially fights Black Bolt in a prison arena but later befriends him. Raava is a female Skrull, and her large body type and strength is a refreshing thing to see in modern comics. Bolt’s exchanges between Raava and Creel reveal his own prejudices of being of royal blood versus a common criminal. This is a book that is not afraid to explore the horrors of mass incarceration and the prison industry all through the guise of science fiction. 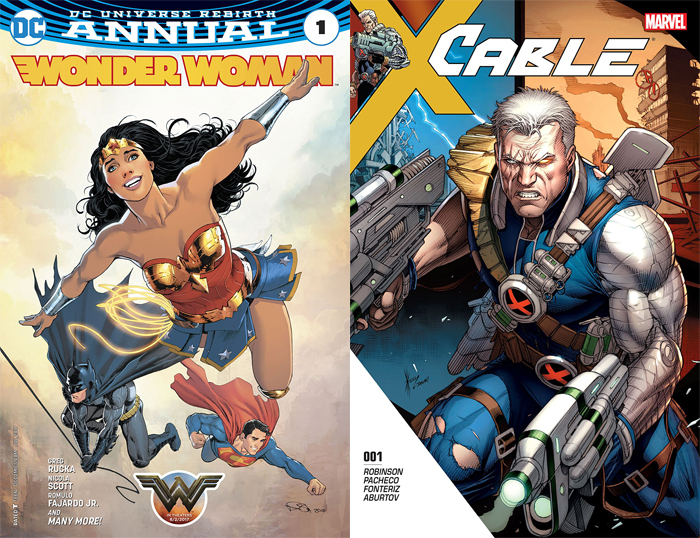 Of course, the art is absolutely spectacular, and while some of the faces look a bit inconsistent (in particular Creel looks off in some panels), the backgrounds feel alien and unique. Ward’s watercolor style is definitely a highlight of reading this book. We don’t learn too much about the mysterious Jailer who captured Black Bolt, but we do meet one of his more obedient prisoners, who looks a bit like The Other from the Marvel films. Ward certainly recaptures that character’s skeletal and otherworldly look in his design. I’m very much looking forward to see where this story goes. The Unsound follows Ashli Granger, a nurse starting a new job at Saint Cassica Mental Hospital, an establishment that is “underfunded, understaffed, and overpopulated.” She’s shown around the hospital by Nurse Jeffers, and meets some of the patients and staff. Many of the people she encounters are clearly off in some way, including administrators who she’s instructed to ignore and avoid eye contact with, and a patient who claims to have been there longer than is possible. The palpable sense of unease in the background builds up to a full on surprise in the last page—the only splash panel in the book. The most remarkable achievement of The Unsound is how lived-in the world feels, especially for an Issue One for a comic with no existing lore. The issue starts with Ashli talking to her landlord, shows her travelling through the streets and subways of (probably) New York, seemingly a routine for her. The hospital itself is full of many neat tidbits in the background that make it feel like it’s existed for years. Much of this is thanks to artist Jack T. Cole, who deserves a ton of credit for his attention to detail without making the page feel overwhelming. Forks stuck in the ceiling, track marks on a heroin addict’s arm, Ashli gingerly grabbing her pepper spray. He manages to sneak in fleeting moments of subtle body horror—not enough to gross the viewer out, but enough to make them realize that something isn’t right, up until the big reveal at the end. There’s not a ton of outright shock, but there’s a lot of vague unpleasantness. Haunted Mental Hospital should be a played out genre (once something gets its own American Horror Story season, you know it’s “classic” at best and “cliche” at worst) but Cullen Bunn’s tight scriptwriting and Cole’s solid art make this work. I came in not expecting much outside the ordinary, but I left wondering where Claire was sent through that door, why the administrators grinned so strangely, why Nurse Jeffers took those pills meant for the patients, and how Xerxes could flip his eyes to where his chin is supposed to be. I don’t know everything about the characters, but I know enough that I want to keep reading and find out Why Everyone Is Like This. A good pickup for those who like modern fantasy, or at least low-key ghost stories.